The calendar tells us that spring started about two weeks ago. I wish someone would tell that to the guy in charge of the weather! It is just so wet here that is the continual rain stopped here, it would take a few weeks to dry out enough to work the soil. I take daily walks out to our growing are and there is really no point. The ground is so wet that there is standing water all over. Not just in our bottom fields. And looking at the extended forecast, it appears that we have another very wet week in front of us. In spite of the weather, we have to move along and keep preparing for the inevitable season change. As mentioned in a post last week, we got the majority of our tomato seeds sown last weekend when John was on Spring Break from college. They are doing well which means that later this week, I need to clean out a year’s worth of “stuff” that has accumulated in the potting shed, get the greenhouse all set up and order potting material. I expect that I will need to start potting up plants early next week. 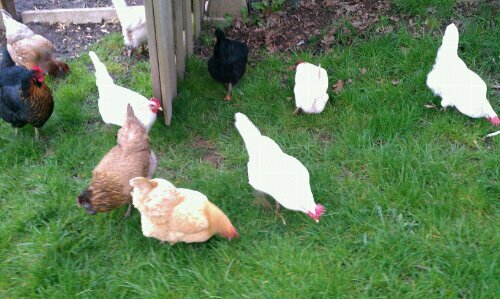 The other night I blogged about our old hens. Although we have never been big meat eaters, more than a decade ago when we stopped eating meat, we still kept our flock. We have never raised them as meat birds since they pretty much become pets. (We do eat chicken but not ones we raise – goofy, I know.) Our hens are kept for their eggs and for the enjoyment they bring just watching them. I personally find them fascinating to watch. I just cannot imagine a farm without chickens. Anyway, another spring related event took place yesterday. We got the poultry accoutrements dug out from the shed and got them setup. 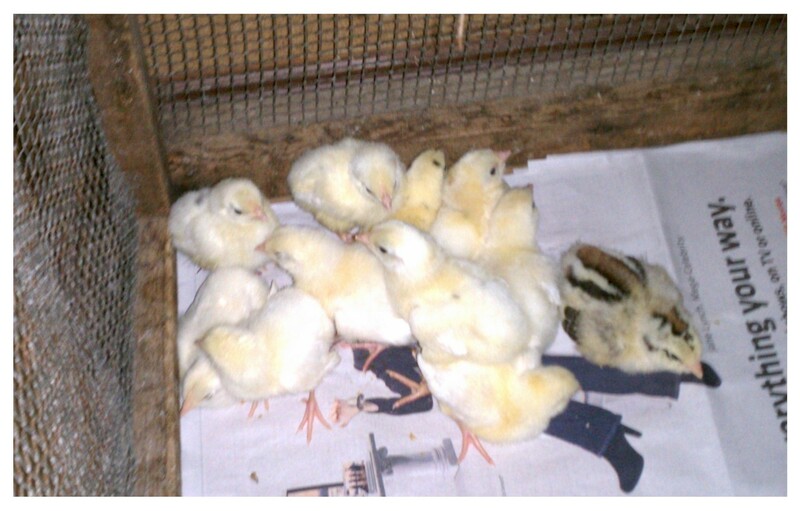 Denise went and picked up a batch of chicks and they are peeping and cheaping, contently snuggling under the heat lamp and doing what chickens all do best . . .
One of the projects on my list this spring is to build two new yards so that I can rotate them every few days. Those of you who are not familiar with chickens, if they have a restricted area in which to roam, they will remove every living thing – plants, insects, seeds – and what is left is reminiscent of the farming practices during the Dust Bowl. They are eating and pooping machines.